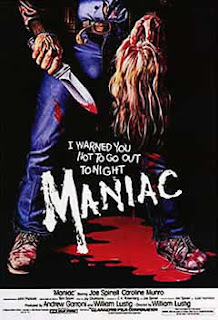 Tag line: "It will tear the life out of you"
Maniac, a 1980 slasher movie about a killer stalking the streets of New York City, is sick, brutal, and perverted beyond belief. It's also a damned fine horror film. Frank Zito (Joe Spinell) is a serial killer. Haunted by the abuse he suffered as a child, Frank now takes out his aggression on the women of New York, whom he murders in grisly fashion before cutting off their scalps (which he then adds to his 'collection'). With an entire city on the hunt for him, Frank strikes up an unlikely relationship with Anna (Caroline Munro), a fashion photographer. Whenever he's with her, Frank is able to control his dark desires, but how long will it be before his sanity once again slips away? Maniac is a violent movie, at times appallingly so. Frank's first two victims, a young couple (James Brewster and Linda Lee Walker) relaxing on the beach, are finished off in typical slasher fashion, but from that point on, the bloodshed escalates. A prostitute (Rita Montone) who promises to show Frank a good time is instead strangled to death, after which Frank pulls out a straight razor and removes her scalp, a particularly gruesome effect courtesy of master make-up artist, Tom Savini. Yet even this is merely a prelude to the carnage that's to follow. In what is unquestionably one of Savini's greatest individual effects, Frank, stalking a pair of lovers making out in a parked vehicle, jumps onto the hood of their car and, brandishing a shotgun, blows the guy's head almost completely apart (the victim is played by Savini himself). Having seen some of Tom Savini's best work (Friday the 13th, The Prowler, Dawn of the Dead), I'm hard pressed to come up with a single effect from any of his other films that tops this. Joe Spinell delivers a chilling performance as Frank Zito, a man who never recovered from the physical and emotional torment of his youth. He has long, rambling conversations with himself (“Why do you let me do that? You have to be careful. You have to listen to me”), moans and grunts incessantly whenever he's on the prowl, and chooses his victims entirely at random, leaving the police with very few clues to follow up on. With Frank, Spinell has crafted a killer every bit as dangerous as Michael Myers or Jason Voorhees, and a whole lot more frightening. Even by the standards established in such classic slasher movies as Halloween, Friday the 13th and My Bloody Valentine, Maniac is a disturbingly gory film. You won't soon forget it. I totally agree with the author that the shotgun blast is terrific effect. I also liked the ending gore sequence, though I'd say it's execution is a tad less successful. I'd also say Spinell is talking to himself in times in a very patient, prim voice, like a parent-child interplay. Very chilling. Proud to have the Blue Underground DVD in my collection.